This week in the garden we have started fall clean-up. We packed away the rowcovers preserving the last rows of green beans, squash and cucumbers, and harvested the last of those crops. Two nights with lows of 22F made it clear it was time. We removed the okra and eggplant “trees”, and pulled up the t-posts from the tomato rows and the asparagus beans. 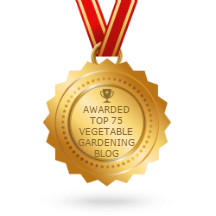 We bundled the asparagus bean trellis netting, along with the bean vines, and tied it up in the rafters of our greenhouse. It will stay there till spring when we will dance on the bundle in the parking lot and shake out the dried bits of vine, so we can use the netting for the 2013 crop. We discovered we can use our power-washer to clean the t-posts before storing them. This saves a lot of time, and converts the job from a tedious chore with knives and wire brushes into a “power rangers” opportunity. We like to get the posts really clean before storing them to reduce the chance of carrying over soil-borne tomato diseases to next season. We have started clearing crops which are less cold-tolerant. This week we are working on the vegetables that get killed at temperatures of 25°F and 20°F. Fall weather in our part of Virginia doesn’t usually get this cold this early, but there’s no arguing with it. We’ve got the Chinese cabbage (Napa cabbage) in and we’re going for the small bit of bulb fennel soon (both 25°F crops). We’re picking the broccoli twice a week as long as it lasts, although yields are right down now. 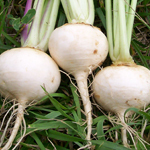 Next we’re after the celeriac, turnips (no rutabagas this year), and winter radishes. Sadly our fall beets all failed, so we don’t need to dig those. We still have some from the spring crop in good condition in perforated plastic bags in the fridge. 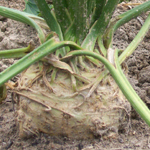 Kohlrabi, cabbage, carrots and parsnips are more cold-tolerant, so they can wait to get harvested in a few weeks. We still have lettuce and celery outdoors under rowcover and hoops. And some of the greens and hardier leeks will feed us all through the winter. Twin Oaks is now in Climate Zone 7a. This means the range of the average annual minimum temperature is 0°F to 5°F. We’re getting ready to plant garlic. The soil has certainly cooled down enough this year! We decided to cut back our total amount of garlic planted this year for two or three reasons. One is that we think we’ll still have enough if we plant 16% less, and maybe we’ll be less wasteful. Another is that we hope the time we’ll save at harvest and curing will enable us to take better care of what we have got, and less will get wasted that way. 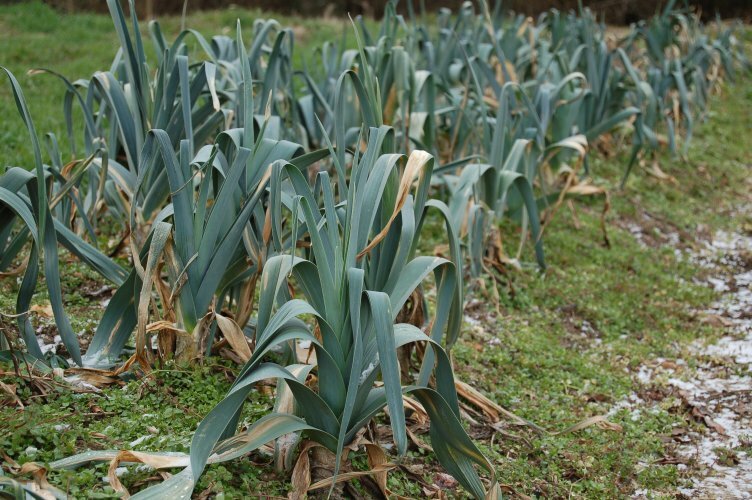 Another is that it will help our crop rotation in the raised beds, where we grow a lot of alliums – garlic and potato onions over the winter, onions in spring, shallots and scallions in the mix, and leeks from mid-summer to late winter. 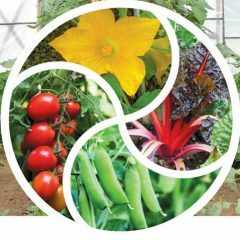 Sometimes doing a smaller amount well is more productive than over-extending ourselves with a big crop. 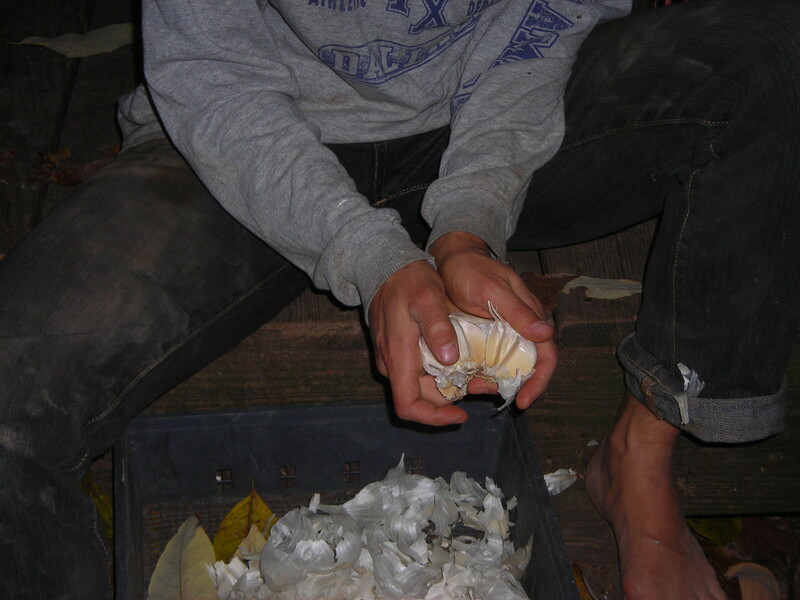 Yesterday we started separating the garlic cloves (“popping” the cloves) at our annual Crop Review meeting. This is when the crew gathers to work through an alphabetical list of crops we grew and talk about what worked and what didn’t and what we want to do differently next year. We plan to try a small amount of West Indian gherkins as an alternative to pickling cucumbers, which seemed plagued by disease. (I saw some very robust gherkins growing at Monticello in September.) We’re looking for a heat-tolerant eggplant variety to trial alongside our well-liked Nadia, which shut down during the early summer heat. We intend to make smaller plantings of edamame next year, and harvest smaller amounts more often, so less goes to waste. We want to try Sugar Flash snap peas and another dwarf early-yielding type of snow peas. (Dwarf Grey works for us, but Oregon Giant didn’t). We’re going to try some purple bush beans to see if that helps us get harvests of nice small beans and fewer ugly giants in the buckets. We debated the harvest size of okra and asparagus too. We vowed to grow fewer different varieties of broccoli and try to find a decent red cabbage. This year we tried Integro, Ruby Perfection and Mammoth Red, but none produced a good amount of nice sized heads. We used to be happy with Super Red 80, but gave it up after two bad years. next year we’ll try Red Express. We strategised about to get red sweet peppers as early as possible. As the tasks to do outdoors start to wind down, we’re upping the pace of our winter planning season. Our next tasks include doing an inventory of the seeds we still have and figuring out our garden plan, so that we can work towards ordering the seeds we want in sensible quantities.